On the Galaxy Note 10.1 one will be able to get true multitasking to the point that you can actually work on two apps side by side, with full functionality on both. You can click on a document, copy from it and paste on the other while they are side by side. Like if I was doing this post on the tab I would be watching this video and typing out on the right of the device. Still on multitasking, you can open email attatchments on one screen, view then on the other half. If you are taking notes on the tab using the stylus you can achieve quite alot. Capturing screnshots, cropping them and embedding them to the pre-installed notes templates is quite easy. And you can add your text on that, with the different fonts and colours. The video is not able to show how well responsive the activity is, but I woud assume it is, since I have used the Galxy Note and it sure is. Video capturing and editing is now at version 2.0. You can now do that at the same time with the same device, and you can use a video in a document. You can just drag and drop stuff you are working on to switch positions, whether left, right, bottom, top. Knock yourself out.And just to add the butter to it, you pinch to zoom the virtual keyboard to fit in the size you want and move to location you want to place it. S Note is one very integral application on the Galaxy Note, and is one of the key selling point. It takes the Tablet from the point of being a content consumption device to a content production device. You do quite alot. And once you select text or any object the clipboard properties show above the screen, so you can copy, cut or paste. Handwriting recognition on this device is on another level, from text to shapes and mathematical fomulas, you get all these done on the device to make your life so easy. They call them productivity tools, text recognition, formula match and shape match. The notes you have written can be organized in folders, and you can preview these in a gallery-like preview, pick the one you want. Just like the feature available in the animations on Samsung CHatON, where you can draw a graphic and the reader will play it to see how you drew it, you can do the same with your drawings, record and play them, Usually good for presentations. You can add music or record your voice too while the drawing is playing. Are you listening teachers? 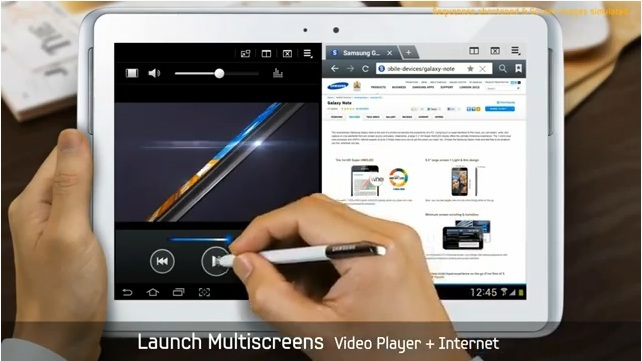 Samsung has something for eduction, and it’s quite good. The splitscreen multitasking feature comes handy here, you can take notes off videos and record them in your books. And the part where you wished you could scribble right on the text books, there’s your dream come true right there.You can also highlight an image or area and add notes about it on the edge of the book. Now this is another amazing feature, you can convert text book images into interactive 3D animations, how cooler can it get? And other nice features that you will notice on the video, see wht architectute students can do with the S Pen. You can highlight focus images and blur the background, or even give it a different background, others we had seen on the previouc Galaxy Note where you can highlight an image and convince people that you actually drew it by converting photos to painting-like art, image duplication and other addons. Other features are like what’s on the Galaxy S III, e.g. buddy photo share, allshare play, smart remote and others.